It's move-in time! But, wait. Are you really ready for spring training and the summer tour? Before you finish packing, listen to this installment of DCI's Field Pass presented by Zildjian. Dan Potter learns about the Drum Corps Medical Project from Dr. Brenda Brak. 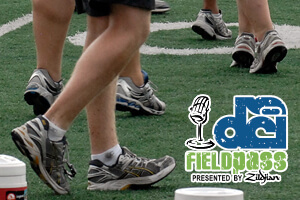 Then, we help marching members prepare their bodies starting with their feet as former Cavaliers member, now podiatrist, Dr. Tom Freeman reveals what shoes are best for drum corps, a brilliant tip to keep your tootsies dry during rehearsal, and what kind of footwear you should never, ever wear to march!